–The fact that the unemployment rate has long been below the rate most economists believe to be consistent with stable inflation means we should be seeing inflation growing much faster than has been the case. 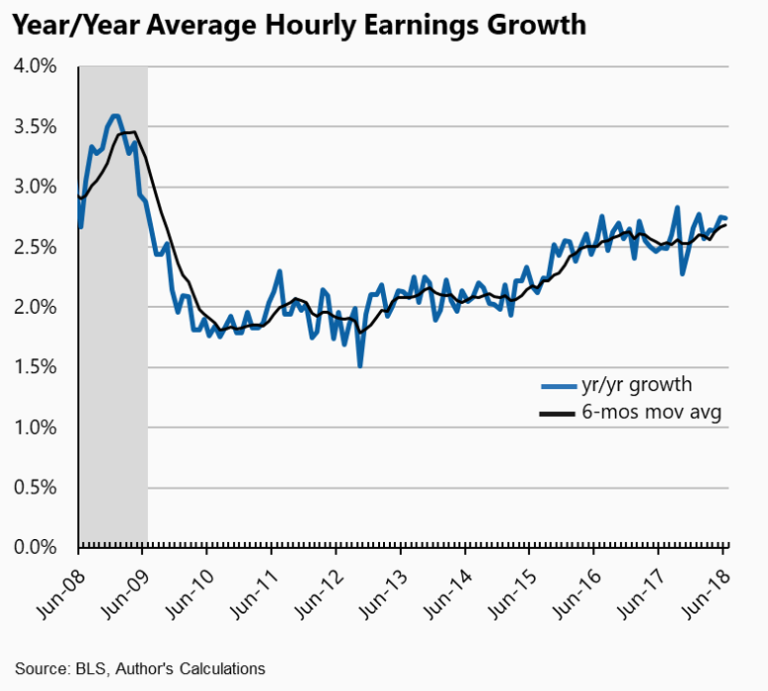 As noted, price growth has ticked up with wage growth, but the Fed’s preferred price gauge is only now growing at their target level of 2 percent (note: unlike the deflator I applied to wages above, this gauge leaves out energy and food prices). 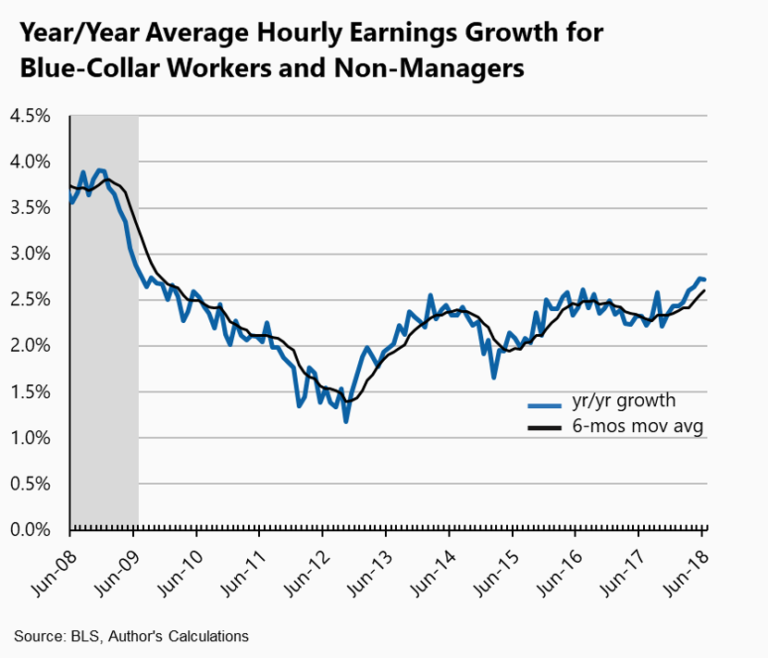 Turning back to the closely watched wage series, the two figures below show the annual growth rates in nominal private sector hourly pay and the pay for middle-wage workers (blue-collar manufacturing workers and non-managers in services). 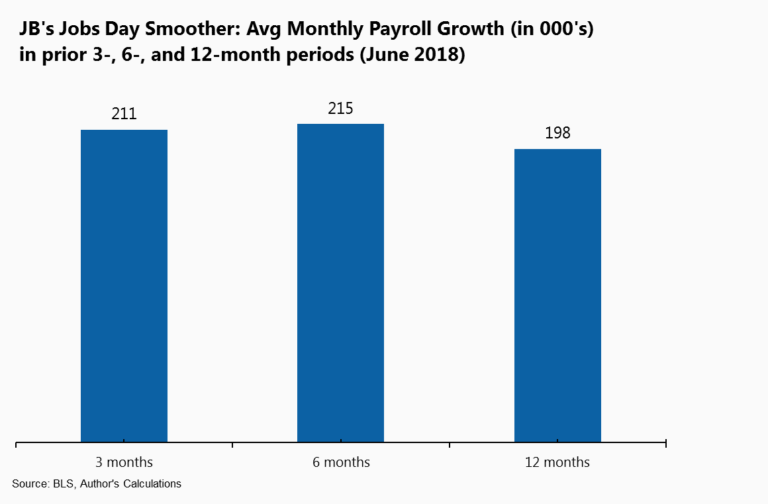 The six-month moving average in both cases reveal the recent acceleration as tightening job market has given wage earners more bargaining clout. 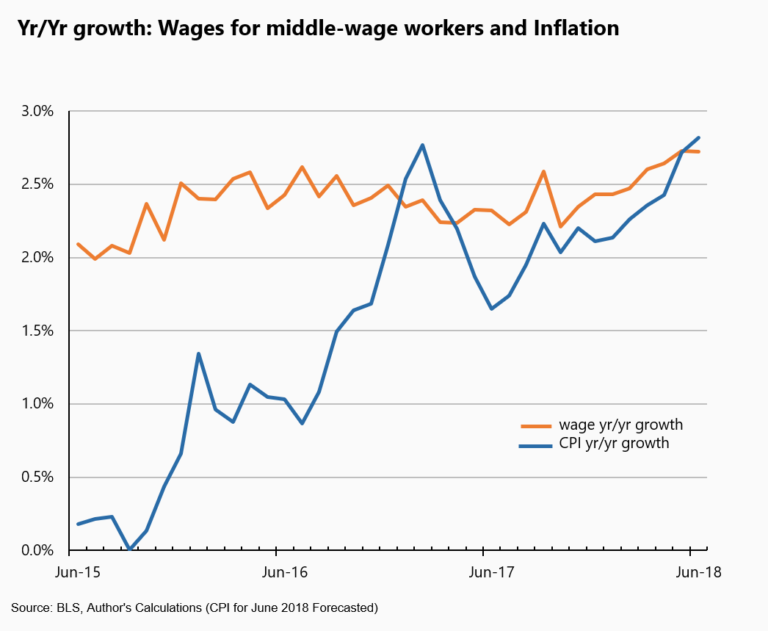 But as the next figure shows, inflation has ticked up as well (I forecasted the value for the June CPI as it isn’t out yet), and is now growing at the same rate as the hourly pay of middle-wage workers. The punchline is that real hourly pay is flat, which should not be the case as we enter year 10 of this expansion. A lot of working families are legitimately asking when they can expect to benefit from what is billed in the financial and political pages as a uniquely robust recovery. Factory jobs got a nice bump, up 36,000 in June, and I saw no evidence in the report of industries in the tradeable sector as yet affected by rising trade tensions. However, as our trading partners retaliate with tariffs of their own, and as Trump’s tariffs raise the costs of imports that go into to US production (e.g., car parts), employment in the trade-impacted sectors must be on the watchlist. In sum, the US job-generation machine continues to post impressive numbers. In fact, these gains are consistent with a job market that has more room-to-run than many believe to be the case. But the wage story remains unsatisfying from the perspective of working families, especially when we look at real wage gains, or the buying power of paychecks. Since this is, of course, what matters most to people regarding living standards, we must recognize that the recovery, even in year 10, has yet to reach everyone.